The Total Air VacuPress® Pump is the brand new addition to the VacuPress® line. The Total Air VacuPress® is modeled after the Air Powered VacuPress® with the additional feature of being completely pneumatically controlled, no electricity is needed to power or control this unit. The Total Air VacuPress® Pump, like the Air Powered VacuPress® utilizes a venturi vacuum pump driven by standard compressed air to generate vacuum. Vacuum Pressing Systems uses only “full flow” single stage venturi vacuum pumps for maximum vacuum draw throughout the entire vacuum process. This guarantees short evacuation time and low overall compressed air usage. This model also features a dual power switch for both vacuum pressing and vacuum clamping. In the press mode the vacuum switch will automatically shut off the compressed air flow when the proper vacuum level is reached. In the clamp mode the pump operates continuously for holding down wooden parts. What sets the Total Air VacuPress® Pump apart from the Air Powered VacuPress® is how the vacuum level is monitored and controlled. The Total Air VacuPress® Pump achieves this completely by the use of compressed air, no electricity is needed. The rugged, dependable, repeatability of pneumatic controls are unmatched. The Total Air VacuPress is designed to be user-friendly by incorporating a regulator for setting compressed air levels and a pressure and vacuum gauge to monitor performance. 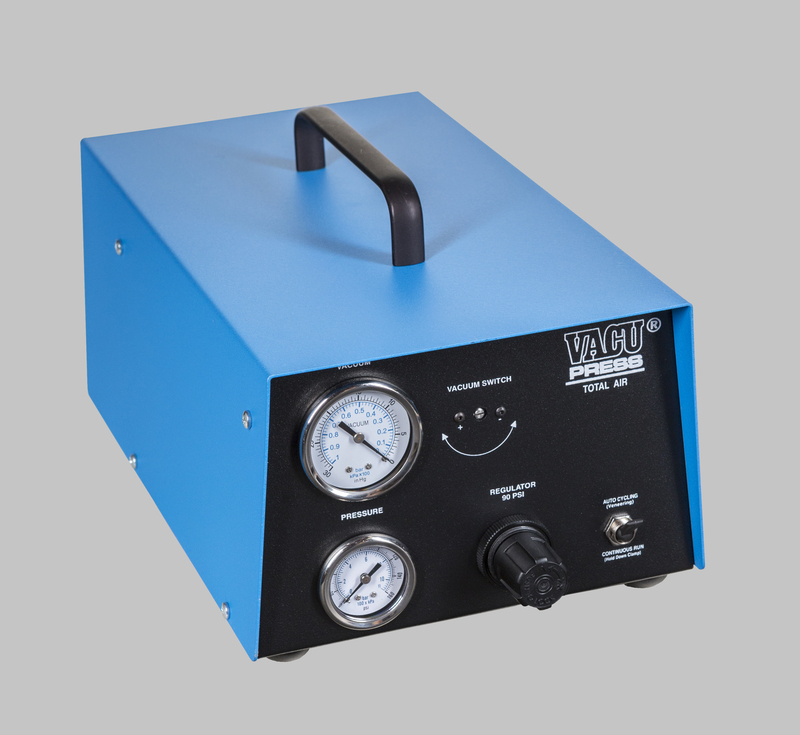 The pneumatically controlled vacuum switch is easily adjustable for setting vacuum levels, and our see-through filter jar provides easy access for periodic dust removal. Single stage, full flow 6cfm venturi vacuum pump-runs cool and quiet with no moving parts. dual position power switch for automatic and continuous vacuum setting. regulator and gauges-for monitoring pressure and vacuum flow pneumatically controlled pressure switch- maintains consistent vacuum level with adjustable pressure setting. easy-access see-through filter jar for dust removal. vacuum quick disconnect between pump and bag. operators manual with complete instructions on pressing veneer, curved woodwork, veneering and laminating glues and vacuum clamping. maximum vacuum 28—Hg. / automatic shut off at 25—Hg.